When exploding health care costs threatened Serigraph's solvency, CEO John Torinus Jr. went outside the box to find a solution. Using his findings, Torinus applied innovative, cutting-edge strategies to cut his health care expenses well below the national average while improving his employees' care. Now, across America, leading companies are following Serigraph's example. There is a revolution brewinga revolution that will dramatically lower health costs nationwide. Torinus, author of The Company That Solved Health Care , the eye-opening book detailing one company's game-changing health care program, now presents The Grassroots Health Care Revolution . Featuring examples and interviews with the business leaders who are at the forefront of these innovations, The Grassroots Health Care Revolution is a game plan for improving workforce health and radically lowering health costs. Torinus avoids the politics of health care to focus on what businesses can actually control. He shows how pioneering corporations have engaged their employees to tame the hyper-inflation that has plagued the health care industry for decades. Executives in leading companies are deploying management disciplines and marketplace principles to invent a better business model for health care. These companies are bending the curve, growing profits and improving the health of their employees. Learn how you and your business can join the revolution. Heading into 2014, American businesses face an important decision about health care: Opt in or opt out? With the Patient Protection and Affordable Care Act, or Obamacare, in effect, companies with more than 50 employees will either offer health care benefits or face penalties. And the choice isn't as straightforward as it may soundin many instances, some companies could save money by paying the fines rather than funding a health care plan. Others would lose money if they dropped coverage. Most employers would like to offer the benefit, but it needs to be truly affordable. Fortunately, the stampede of innovations introduced in the private sector over the last decade has simplified the decision; health costs can be managed if corporate managers make it a strategic priority. John Torinus Jr., author of The Company That Solved Health Care , the eye-opening book detailing one company's game-changing health care program, now gives Opt Out on Obamacare, Opt Into the Private Health Care Revolution , a game plan for improving workforce health and dramatically lowering health costs. Unlike the new national law, it concentrates on management science, not politics. Innovative corporations have engaged their employees in taming the hyper-inflation that has plagued the health care industry for decades. CEOs, CFOs, and COOs in front-running companies are deploying management disciplines and marketplace principles to invent a better business model for health care. They are bending the curve, and this book shows you how to follow suit. America's market-based health care system, unique among the nations of the world, is in large part the product of an obscure, yet profound, revolution that overthrew the medical monopoly in the late 1970s. In this lucid, balanced account, Carl F. Ameringer tells how this revolution came into being when the U.S. Supreme Court and Congress prompted the antitrust agencies of the federal governmentthe Federal Trade Commission and the Justice Departmentto change the rules of the health care system. Ameringer lays out the key events that led up to this regime change; explores its broader social, political, and economic contexts; examines the views of both its proponents and opponents; and considers its current trajectory. It has been nearly a decade since the first edition of the Handbook for the New Health Care Manager was published. During that time, dramatic changes have taken place in the health care industry and particularly in health care management. Written as a hands-on guide for both novice and seasoned managers, the Handbook for the New Health Care Manager, Second Edition offers a wealth of practical strategies, procedures, and methods that are designed to meet the myriad challenges of today's health care marketplace. This thoroughly revised and updated edition features new information on numerous topics. This crystal-clear book offers to any who will listen invaluable, detailed guidance on how and why to move toward a true culture of excellence in hospital care. It isn't easy, but, as their results show, it's a journey well worth taking. "Donald M. Berwick, MD, president and CEO, Institute for Healthcare Improvement The Baptist Health Care Journey to Excellence presents tested principles and best practices to help improve your corporate culture and customer satisfaction, which will lead to loyalty, stability, sustained productivity, and profitability in your own organization. Order your copy today! For more than a quarter of a century there has been significant international migration of skilled health workers, but in the last decades, with critical changes in both sending and receiving countries, few parts of the world are now unaffected by the consequences of the migration of health workers, either as sources, destinations or sometimes both. The book takes the understanding of health worker migration substantially beyond the more scattered and fragmented papers and anecdotes that largely existed before, into the first consolidated analysis. In doing so it reveals its exceptional significance for both sending and receiving countries (in economic, social and political terms), provides the only analysis of remittances of health workers, casts new light on gender, globalisation, transnational linkages, the trade in services (linked to GATS) and the overall relationship between migration and development, and reviews practical responses and solutions. From a veteran physician comes this remarkably clear-eyed look at what's wrong with how we adminster and pay for health care and what can be done to fix it. In Shock Therapy for the American Health Care System: Why Comprehensive Reform Is Needed , Dr. Robert Levine offers an easily understandable diagnosis of the problems plaguing our current health care infrastructure, with discussions that include the roles of various stakeholdersinsurance companies, "big pharma," hospitals, health care providers, and patients. He also dispels a number of myths designed to make voters leery of any reform efforts. Levine's comprehensive plan addresses everything from bloated bureaucracies to unnecessary procedures to the handling of negligence and malpractice lawsuits/claims. Throughout, Levine backs his proposals with facts and comparisons to systems in various countries, and concludes that even now, with disaster looming, the ultimate goal of providing health insurance for every American is achievable and affordable. Over the past couple of decades, individuals have come to rely more on home health care visits for their health care needs. While there have been decreases in hospital stays and in the percentage of older persons living in nursing homes the consequence has been the emergence of a new type of occupational crime: home health care abuse. In considering offending in the home health care industry, it is important to focus on crimes by and against home health care professionals. This book is one of the first to fully address abuses occurring in the home health care industry. Its intent is not to suggest that home health care is a dangerous field for workers and consumers; rather, the intent is to shed some light on the types of misconduct found in home health care. Each chapter will include a wealth of examples to illustrate that these incidents actually are real, devastating, and significant. At the end of each chapter the reader will find a series of discussion questions designed to encourage the reader to reflect back on the content of the chapter through the eyes of those involved in the response to home health care fraud. Also included are Web site addresses where readers can learn more about the offenses and other resources to help demonstrate ways to deal with the problem. It is intended for criminal justice officials, health care professionals, academics, and researchers who want to better understand the nature of offending in the home health care industry. It is also intended for use in criminal justice, sociology, and white-collar crime courses exploring crime in the workplace as well as courses examining the home health care field. Chapters include: Home, Home on the Range: Where Health Care is Provided and Crimes are Committed; Home Health Care Professionals as Victims and Witnesses; Crimes by Home Health Professionals: Violence, Theft, and Deception; Responding to Crime in the Home Health Care Field: Strategies, Obstacles, and Issues; and Preventing Home Health Care Misconduct. A primer in plain English that explains how healthcare will work under the new legislation and how it will affect your care and your choices going forward. Within the last twenty years a large-scale bottom-up privatization has taken place in Vietnam, changing and dismantling the public health care system. This process has led to severe tensions inherent in the transitional society of Vietnam between equity and access to health care support  especially for the poor, elderly, migrants, and ethnic minorities  on the one hand, and its efficiency on the other hand. The book traces the reform efforts to modernize the health care system by the Communist Party of Vietnam and the Vietnamese government. The author bases her findings on little known primary literature and interviews with key stakeholders of the policy network involved in the reform of the health care system, thereby painting an authentic atmospheric picture of the profound changes in the health care system in Vietnam. Pharmacy and the US Health Care System offers a complete source of current information about the features of the US health care system including the personnel and institutions, as well as concise reports on trends, regulations, policy and finances. The text provides an overview of the Australian Health Care System at a level suitable for 1st year undergraduate students. It describes the architecture' of the system and its key components (public hospital sector, private hospital and health insurance, GPs and primary care, community health, public health), some of the things that shape the system and introduces key concepts that underpin it such as the idea of the welfare state or a universal health system. In this third edition of Understanding the Australian Health Care System , authors Eileen Willis, Louise Reynolds and Helen Keleher introduce the reader to the key issues and theoretical concepts that provide insight into the way the Australian health care system is organised and how policy change impacts the health care profession. The third edition has been comprehensively revised, but continues to focus on the role and function of the health professional working within the Australian health care system. Fifteen health disciplines are considered in this new edition, with an emphasis on interprofessional practice and the social determinants of health. New chapters on workers' compensation systems, oral health and dental services, clinical exercise physiology and pharmacy Significantly expanded glossary Up-to-date information on the most recent Australian health reforms Case studies on all of the major health care professions in Australia, including nurses, midwives, speech pathologists, audiologists, health managers, paramedics, social workers, dietitians, doctors (GPs), occupational therapists, physiotherapists, dentists and oral therapists, exercise physiologists, pharmacists and homeopaths A suite of video interviews with multidiscipline practitioners and thought leaders exploring aspects of Australian health care, theories and challenges now and for the future. Foreword by Harvey V. Fineberg, President of the Institute of Medicine For decades, experts have puzzled over why the US spends more on health care but suffers poorer outcomes than other industrialized nations. Now Elizabeth H. Bradley and Lauren A. Taylor marshal extensive research, including a comparative study of health care data from thirty countries, and get to the root of this paradox: We've left out of our tally the most impactful expenditures countries make to improve the health of their populations-investments in social services. 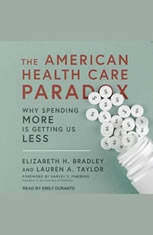 In The American Health Care Paradox , Bradley and Taylor illuminate how narrow definitions of "health care," archaic divisions in the distribution of health and social services, and our allergy to government programs combine to create needless suffering in individual lives, even as health care spending continues to soar. They show us how and why the US health care "system" developed as it did; examine the constraints on, and possibilities for, reform; and profile inspiring new initiatives from around the world. Offering a unique and clarifying perspective on the problems the Affordable Care Act won't solve, this book also points a new way forward. The book presents a social analysis of the Medical Health Care of Women with special reference to their reproductive health. In the context of India, Author Dr. Swarn Lata Sakhuja was formerly a reader at a post-graduate College in Saharanpur. Being a student of sociology, she has tried to impress upon the need to improve health conditions and medical facilities for expectant mothers. The book focuses mainly on women in Uttarakhand regions of hilly and tribal origin. 2018 International Book Awards Finalist in "Business and Management" Category We shop for everything else onlinewhy not benefits? Using private benefit exchanges (a.k.a. online benefits marketplaces), employers can bring a consumer-centric online shopping experience to benefits. Alan Cohen, a benefits technology pioneer, details how these platforms can offer unprecedented flexibility and choice to employees, revolutionize the way employers attract and retain talent, strengthen cost control in an era of skyrocketing premiums, and promote much-needed innovation in the U.S. health care system. Discover How To Make sense of today's challenging benefits landscape and plan breakthrough changes that have succeeded for thousands of employers of all sizes Leverage the lessons of the online shopping revolution to drive radical innovation Incorporate the 7 key pillars of a true private benefits exchange into your benefits mindset Gain indispensable practical insights from early adopters' experiences Clarify the new roles of employers, HR, insurers, brokers, employees, and other stakeholders Accelerate your transition away from inefficient employer-managed plans Assess the ongoing impact of health care reform, public exchanges, health care consumerism, and other trends Alan Cohen created one of the first private exchange platforms and has pioneered this approach for more than a decade. Now, in a candid discussion of how the economic principles of choice, consumerism, and defined contribution are at work in an exchange environment, he breaks down the concept for HR professionals, entrepreneurs, brokers, insurers, health care reformers, policy makers, and employees. Cohen looks to social and economic implications to forge a future in which all eyes are on a new model of the consumer for the benefits age. With insights from industry veterans, Employee Benefits and the New Health Care Landscape brings a fresh perspective to the debate on health care and health insurance in America. This book collates the expertise and experience of leading medical professionals to give foreign medical graduates an understanding of the American health care system. All the fundamental stages in the preparation of a foreign medical graduate for medical training in the US are covered. The book aims to provide essential information and guidance on how to navigate the American health care system. The characteristics of it are described in this concise and easy to read volume to help foreign medical graduates integrate into the American system.